Lesson 13 addresses the role of the “Law” in Christ’s kingdom. Before looking at the individual lessons I’d like to address a couple of key issues that will help inform the rest of the commentary. First, orthodox Protestantism and Seventh-day Adventism each have different sources of authority. This difference significantly impacts their theological conclusions, and for Adventists is alters their use of common language. This section includes a summary of concepts taken from Kevin DeYoung’s newest book titled, Taking God at His Word; I highly recommend this book for a deeper study on the doctrines of scripture and its sufficiency. One of the greatest reasons professing Christians come to such varying (and sometimes opposing) theological conclusions is that they have differing views on what is considered to be authoritative. For example, the Roman Catholic church holds church tradition on par with scripture and the pope is over both. For liberals, while scripture is informative, experience and reason are authoritative. In Seventh-day Adventism, both scripture and Ellen G. White are said to be continuing and authoritative sources of truth (fundamental belief 18). This shared authority has created a set of doctrines and a world-view that is unique to the Seventh-day Adventist church (much like the Mormon’s and Jehovah’s Witnesses). For orthodox Christians, however, the Holy Scriptures are the only authority and final word on all matters. The following paragraph is taken from the Westminster Confession of Faith on the authority of scripture and is a fair representation of orthodox Protestantism’s position on this matter. Included in this position is the belief that “the saving message of Jesus Christ is plainly taught in the Scriptures and can be understood by all who have ears to hear. We don’t need an official magisterium to tell us what the Bible means.” (K. DeYound, p. 44). Just as the work of Christ is complete and sufficient for salvation, His word is complete and sufficient for revealing His work; and His Spirit is sufficient for teaching us His word. The sufficiency, authority, and clarity of scripture eliminate any need for new revelation or for new “prophetic” interpretations of scripture. Any time we are told that we need a new message we can know that we are being told that God’s word is not sufficient, is not clear, and is not the final word on matters of faith. It ought to be fair for us to agree that language loses its function if the definitions of words within a single language are arbitrarily altered or assigned by various people. A superficial study in apologetics will show that this is a common practice among unorthodox or cultic religious groups. If we are to have honest theological discussions we can only do so if we are speaking the same language. Hubert F. Beck writes in his book, How to Respond to the Cults, “A form of double-talk also characterizes cults. By this, we mean that they use ordinary terms in special ways that only the cult members understand…The one thing that must be kept in mind is this: What a word means to you is by no means what the same word may mean to a cult member. This makes dialog with cult members difficult.” (H.F. Beck, P. 11). We will see in this week’s lesson how the authoritative nature of Ellen G. White leads to theological conclusions which stand in opposition to biblical orthodoxy and how those conclusions affect their use of language. We will also see why it is crucial that we respect the meanings of words within in their contexts and their language of origin if we are to arrive at a biblical world view. We all know that context determines how we understand and define words. Dr. Elizabeth Inrig uses the example of a trunk, “If I say that I am going to pack my trunk for vacation we know from the context that I am probably not talking about an elephant’s trunk.” What we know about travel, about elephants, and about what she is going to do to the trunk helps us understand what she is talking about. The same applies when interpreting scripture. What does scripture teach us about scripture? As St. Augustine said, the New Testament is concealed in the Old Testament, and the Old Testament is revealed in the New Testament. The Old Testament points us toward the New Testament and the New Testament explains the old—not the other way around. When Adventists read Jeremiah 31:33 they interpret the word “Law” to mean the 10 commandments; but a careful reading of Hebrews would reveal that can’t be a right interpretation because the 10 commandments are the words of the Old Covenant which is called obsolete and passing away (Hebrews 8:13; 9:4; Exodus 34:28). If we have a high view of scripture than we cannot say that it contradicts itself, rather we must concede that our understanding is faulty. God would not tell us on the one hand that the 10 commandments are the words of the old covenant and are obsolete and passing away and then tell us that we are also under the old covenant. We cannot call God double-minded, instead we must examine our interpretation of the words. Now we know from Psalm 119 (as well as many other passages of scripture) that the word “Law” is used synonymously with God’s testimony, precepts, and word—to name a few. Just as we know that when Paul says we are “no longer under the law” in Romans he doesn’t mean that we are no longer under God’s word or testimony (John 17:17; 1 John 5:9,10) but instead that we are no longer under the old covenant, we also know that based on the letter to the Hebrews that the law written on our hearts cannot be the words of the old covenant but rather the testimonies of God (1 John 5:9,10), the precepts of God (which extend far beyond the 10 commandments), or the word of God (John 1; Eph 1:13,14). Unfortunately this misunderstanding of Jeremiah 31:33 does not simply come from not understanding the greater context of scripture, which is why contextual teaching alone isn’t enough to correct this error. This inaccurate teaching is rooted in Adventism’s unique source of authority. Ellen G. White teaches with great zeal that keeping the 10 commandments faithfully is the mark of a true believer. The Great Controversy world view teaches that the defining marker of those who enter the gates of Heaven is whether or not a person keeps the seventh-day Sabbath of the old covenant. Their source of authority has required them to interpret scripture outside of its context and within the paradigm of the visions of their prophet and because of that Jeremiah 31:33 becomes a proof text for the idea that true believers will keep the Sabbath because God will put it on their heart to do so. This sort of misapplied scripture or interpretation is not unique to this one text. 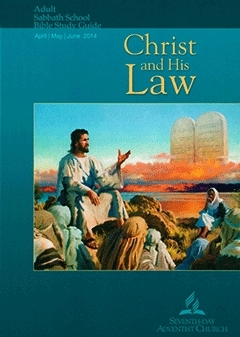 Anywhere the words “law” or “commandments of God” are extoled in scripture the Adventist mind conjures up the idea of the 10 commandments, and wherever the “law” is used to speak against us or as something that we are no longer under it is explain away by dividing the old covenant into two parts and claiming that scripture is referencing everything BUT the 10 commandments (this kind of division cannot be found in scripture, the old covenant stands and falls together [Hebrews 7-9]). Rather than going through each text used wrongly in this week’s study we will only focus on a few to help you see how the Adventist world view requires an altered meaning and often consequently creates contradicting doctrinal conclusions. I do encourage you to look up each text and read the entire book, or at the very least the entire chapter, it is found in to gain a fuller understanding of the context. The dominant theme in Sunday’s lesson is the story of the Great Controversy where Christ and Satan are dueling arch enemies and Satan has great power but Jesus overcame the temptation to sin when tempted by Satan and his victory over sin gives us the assurance and promise of our victory over our own sin, which results in our participation in God’s eternal kingdom. A careless reading of this lesson may seem harmless but look closer at what is being taught here. What is it that Jesus was victorious over? His own temptation to sin. What does His ability to not sin assure us of? Our ability to not sin. What is the result of our not sinning? Do you see how this stands in direct opposition to the substitutionary atonement of the Lord Jesus Christ by which we are counted righteous before God by grace (unmerited favor) through faith in the Son of God? Do you see how this stands in direct opposition to the doctrine of human depravity taught all throughout scripture? Even if this passage were teaching that we presently have the assurance of salvation through the substitutionary atonement of Jesus Christ that would stand in direct opposition to the Seventh-day Adventist fundamental belief 24 as taught by their continuing and authoritative source of truth (belief 18) in her book The Great Controversy. Here again the lesson is undergirded with the Great Controversy world-view which cannot be pried away from Adventist thinking or teaching, nor can it be supported by God’s word. It must be stressed that Ellen G. White is the unique religious authority of Seventh-day Adventism and that her “present truth” is the foundation of their doctrines and interpretations of scripture which result in the altered definitions of biblical words. Central to the Great Controversy world-view is the freedom of human will and the sovereignty of Satan over earth, “Through violating God’s law, he (Adam) forfeited his right to earthly sovereignty, and ownership went to the archenemy, Satan,” (Sunday’s lesson). Within this paradigm it is said that humans make a choice over whose kingdom will have their allegiance, however the Scripture says that no one choses God apart from God first calling them which is a direct assault to the idol of human free-will. Man is born dead and unable to choose God but God being rich in grace and mercy made us alive together with Christ and caused us to be born of God not by our own will but by the power of the resurrection of the Lord Jesus Christ (John 6:44; Eph 2; 1 Peter 1; John 1:12). Concurrently the scriptures do teach that we must repent and believe, but this cannot happen apart from God’s sovereign work in our lives, whether or not this is a difficult doctrine to believe, it is one the Bible teaches and one must decide if scripture is their ultimate authority or not; if so you must choose to live under scripture and concede to not understand it all but to remain submitted to it rather than explain it away to fit a mold. Since Adventist doctrine requires a profound emphasis on human will, little attention is given to the sovereignty of God or the reality of the new birth. The author of today’s lesson spends a great deal of time talking about the believer’s responsibility to turn their back on Satan and obey God’s commandments (the 10 commandments) because Satan is anxious to get them back. Here again we see no assurance of salvation. The assurance mentioned in Sunday’s lesson was most certainly the assurance that one can overcome their sin if Jesus did. Again Adventist’s interpret the word “commandments” in this text to mean the 10 commandments of the old covenant. I want to spend some time looking at the literary context and the original language to help us understand this text. The author of Revelation is the Apostle John. John wrote 5 books in the New Testament; the gospel of John, 1st, 2nd, and 3rd John, and Revelation. In all 5 of these books when John is referring to the Law of Torah or the old covenant he uses the Greek word “nomos”, otherwise when the word commandments is used it simply means teachings and he uses a form of the Greek word “enotle”. I will offer a few examples of this below with links to the words or passages taken from an online Greek interlinear bible. If you click on the link you can also click on the Greek words for definitions or others uses of the word. In the Revelation 14:12 text, the word used for commandments is “enotlas”. It is worth mentioning also that John 14:15, “If you love Me, you will keep My commandments.” (which is another proof text for keeping the 10 commandments) uses the word enotle as well; and in the greater context of chapter 14 you can see in the original language the Jesus says that those who love Him keep His word and His teachings. It is not a statement of love or loyalty to keep the Sabbath as the Great Controversy teaches. We see that Jesus used enotle above to speak of those who keep His teachings, but when Jesus talks about the law of Torah he uses the word nomos, “But the word that is written in their Law (nomos) must be fulfilled: ‘They hated me without a cause.’” John 15:25. So you can see that consistently when the law is spoken of as Torah or the old covenant the word used in the books John authored is nomos, and when John is talking about the teachings or words of Jesus or God he uses a variation of the word entole. We must remember that all scripture is God-breathed, it is inspired by God in the original language and it is trustworthy and consistent. Further, we ought to remember the charge of Jesus before His ascension in Matthew 28: 19, 20, that we go into all the world teaching all He had commanded us (again the word used comes from entole, not nomos). Now even without a study on the original language we can remember that Jesus tells us all throughout the gospel of John that nothing He says or does is done apart from the Father. What Jesus taught us was what the Father taught us. Jesus commandments are the Father’s commandments revealed by Jesus. When John writes, his purpose is to show us that the Father and the Son are one; that Jesus is God just as the Father is God. It is worth also noting that the saints referred to in the Revelation text are already worshiping the true God and it is said of them earlier in the chapter that they are the ones “who follow the lamb wherever he goes.” This language is reminiscent of Jesus words in John 10: 27-30. The saints in Revelation 14:12 are not under investigation to see if they will keep the 10 commandments, they are the sheep of Christ who follow Him, who know Him and are known by Him and keep their faith in Him. “But what does it say? ‘The word is near you, in your mouth and in your heart’—that is, the word of faith which we are preaching, that if you confess with your mouth Jesus as Lord, and believe in your heart that God raised Him from the dead, you will be saved; for with the heart a person believes, resulting in righteousness, and with the mouth he confesses, resulting in salvation. For the Scripture says, ‘Whoever believes in Him will not be disappointed.’ For there is no distinction between Jew and Greek; for the same Lord is Lord of all, abounding in riches for all who call on Him; for ‘Whoever will call on the name of the Lord will be saved. How then will they call on Him in whom they have not believed? How will they believe in Him whom they have not heard? And how will they hear without a preacher? How will they preach unless they are sent? Just as it is written, ‘How beautiful are the feet of those who bring good news of good things!’” Romans 10:8-15. We see from this passage in Romans that general revelation is not enough to be saved. If you revisit the introduction to this commentary you will see, however, that liberals will say that experience is authoritative and scripture is only informative, so if one subscribes to that believe and is not sola scriptura the statement in the lesson for today would not be an issue. The combination of texts used in today’s lesson show the common teaching in Adventism that Christian’s who do not believe they are under the 10 commandments think that it is OK to steal or commit adultery or lie. This straw-man argument is used to avoid the deeper issues of study required to expose the errors of Adventism and the reality of what it means to live in the New Covenant. For an in depth study on this I recommend Christ Lee’s study on The Covenants. I will not address the use of Ellen G. White at the end of today’s lesson beyond saying that Seventh-day Adventists do not live by sola scriptura as they often claim. Their doctrines fall apart without Ellen G. White. Today’s lesson deals with whether or not sin will arise again after the creation of the new earth. The lesson is laced with concepts taken from the Great Controversy, including the idea that the entire purpose of what Jesus did was to restore the world back to Eden. The most striking thing about this lesson truly is the absence of Jesus (with the exception of the text in John which is paid no attention to in the lesson). Read again how the author explains why there will be no more sin or rebellion in Heaven. Do you see the difference in thought here? The first paragraph sounded a lot like Sunday’s lesson. It is obedience to the law and the ability to overcome sin that will both give and sustain salvation. The second recognizes the helpless state of man and the redemption sustaining power of the Lord Jesus Christ to His glory alone. The 10 commandments existed for all the ages until Lucifer rebelled. The angels were ignorant of the fact that the law was in Heaven. The 10 commandments will be necessary in the kingdom to manage the interactions of the saints. The Law is the essence of God’s kingdom. I encourage you to find these teachings in God’s word. If you cannot, then I encourage you to pray that the Holy Spirit would help you know what ought to be authoritative in your life. I will not address the quotes by Ellen G. White in today’s lesson other than to say they provide evidence of her authority and necessity for the foundational world-view of the Seventh-Day Adventist organization. If you are an Adventist who thinks that you can believe unique Adventist doctrines without believing in her than I urge you to prove it. If you are right you will only gain wisdom, if you are wrong and are convicted you may find yourself on your knees in repentance before a Holy and forgiving God. The one thing I agree with Ellen G. White on is when she wrote this, “My work... bears the stamp of God or the stamp of the enemy. There is no halfway work in the matter. The Testimonies are of the Spirit of God, or of the devil." (Testimonies For The Church, Volume 4, Ellen White, p. 230). If you are using this commentary to teach a Sabbath school class then I encourage you to have your class work together to outline the doctrines which are uniquely Adventist within the lesson and then spend some time supporting them with scripture alone while respecting the full context of each passage. If the class becomes frustrated and professes their faith in Ellen G. White’s “gift” or authority, challenge them to deal with the Adventist claim that they live by Sola Scriptura as the reformers did, and ask them what they are to do when EGW and the word of God contradict. A good way to start this is to ask your class to raise their hand if they have ever wondered what belief of theirs came from Ellen G. White and what came from the Bible. I want to leave you with this passage from Keven DeYoung’s book, Taking God at His Word. “‘The Holy Spirit no longer reveals any new doctrines but takes everything from Christ (Jn. 16:14),’ Bavinck writes, ‘In Christ God’s revelation has been completed.’ In these last days, God speaks to us not by many and various ways, but in one way, through his Son. And He speaks through His Son by the revelation of the Son’s redeeming work that we find first predicted and prefigured in the Old Testament, then recorded in the Gospels, and finally unpacked by the Spirit through the apostles in the rest of the New Testament. Scripture is enough because the word of Christ is enough. They stand or fall together. The Son’s redemption and the Son’s revelation must both be sufficient. And as such, there is nothing more to be done and nothing more to be known for our salvation and for our Christian walk than what we see and know about Christ and through Christ in His Spirit’s book. Frame is right: ‘Scripture is God’s testimony to the redemption He has accomplished for us. Once that redemption is finished, and the apostolic testimony to it is finished, the scriptures are complete, and we should expect no more additions to them.’ Or as Packer put it, more tersely but no less truly, ‘There are no words of God spoken to us at all today except the words of Scripture.” (K. DeYoung, pp. 51-52). If the words above are true, than all that Ellen G. White has brought to the Christian faith has been rooted in and soiled by heresy and should be renounced by all Bible believing Christians. Copyright 2014 BibleStudiesForAdventists.com. All rights reserved. Revised June 18, 2014. This website is published by Life Assurance Ministries, Camp Verde, Arizona, USA, the publisher of Proclamation! Magazine. Contact email: BibleStudiesForAdventists@gmail.com.